As the resident food expert, I said, “No. 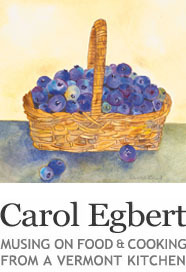 Nectarines are a crossbreed of peaches and plums.” He was confident and I was confident. It was time to Google. 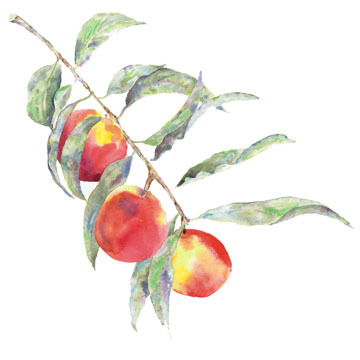 We logged on and there it was “… nectarines belong to the same species as peaches but have a recessive gene that gives them a smooth rather than fuzzy skin”. Who knew? Charles knew. I used an electric mixer to combine an eight-ounce block of cream cheese and a can of sweetened condensed milk. When the cheese and milk mixture was smooth and lump free, I added the juice of half a lemon, about two tablespoons, and one tablespoon of lemon rind. The lemon juice curdled the sweetened condensed milk and the liquid became a creamy custard. I spooned it into a graham cracker crust from the market and put the pie in the fridge while I prepared the peaches. I put four peaches into a saucepan of boiling water for one minute, cooled them in a bowl of ice water and slipped the skin off. I cut them into wedges and stirred in two tablespoons of Gran Marnier and two tablespoon of apricot jam. I spooned the peaches onto the pie and put it back into the fridge to cool. The creamy filling can be modified to accommodate the contents of your fridge – you can make the filling without the cream cheese using two cans of sweetened condensed milk and a quarter of a cup of lemon juice instead. If you want a filling that is less dense, fold in half a cup of heavy cream that has been whipped to stiff peaks before you put the custard in either a pastry or graham cracker crust pie shell. Thanks for all the ‘peachy’ comments. That pie sounds positively delightful. I love seeing all of the peach recipes floating around food blogs this time of year. This one is a winner! Oh peaches! Love peaches. I always thought nectarines where some deviant, hairless cousin of peaches LOL Love the fact that this doesn’t need baking and the lovely zing of lemon juice, generously used! This pie sounds so divine! AND the fact that it doesn’t require baking, well, that’s tops in my book when the summer’s been so hot. As always, your art work is stunning!